Yesterday I did what I thought it would take another week to do: finished Seven Gables. It’s not that long a book, but it took me about seven weeks. That’s one week per gable! H7G is actually a lot less grim than I was expecting. It’s got a few creepy moments, particularly the opening death, but overall it’s a long wait between creepy moments and plot developments. It opens with old Hepzibah Pyncheon, one of the last remaining Pyncheons – an old and unhappy New England family. The unhappiness goes back two hundred years to when the first Pyncheon stole land from his neighbor and helped get him hanged for a wizard. Ever since then Pyncheons have done now better now worse, but mostly worse. Hepzibah’s a crazy cat lady without cats. The neighbors avoid her and she them, but she’s not without gumption and facing destitution she decides rather than taking money from her hated cousin Jaffrey, she will open a shop. Hepzibah’s not really a people person and her shop seems doomed to failure except for the arrival of the perfect miss Phoebe from the country. Phoebe’s a ray of sunshine and competent. Her never-failing good cheer and industry make the shop a going concern. Then arrives Hepzibah’s brother Clifford who has been away for a long, long time. We don’t know exactly where or why until near the end, but Clifford is basically now incapable of anything except enjoying a cup of coffee, a seat in the garden and now and then nearly throwing himself out a window in a panic. In addition to these three is a daguerreotypist named Holgrove. The book goes on rather a long time describing what passes for domestic bliss under these circumstances, now and then pausing to fill in a bit of the past family history or reveal some clue and it’s not until two thirds of the way that things start to move a little faster. It’s not without some charm. The characters, except the Judge, are all likable and I was certainly rooting for them over him the whole time. I was hoping for a bit more excitement at the end, but it’s just not that kind of book. The plot is rather simple and while there’s some suspense near the end, Hawthorne never lets the action getting in the way of waxing lyrical about the weather or the Italian organ grinder. I would say if you want a good story, go read the Moonstone or Bleak House instead. Sadly, I don’t think this meets any of my myriad challenges. I was supposed to make this report a week ago. And, unlike some readalongs where I didn’t report because I hadn’t done the reading, I’ve actually done the reading. Sometimes one just doesn’t feel like blogging because one is too busy playing Simpson’s Tapped Out doing incredibly important things. So this readalong is hosted by the lovely Jean of Howling Frog Books and I think there are maybe three of us who are damn fool enough to attempt to tackle this monsterpiece of medieval literature. And now looking at the schedule again, I believe I misread it and have only just now gotten to where I was supposed to be a week ago: Lucius the Emperor of Rome. This is kind of too bad as I was enjoying believing I was a little ahead of things. Oh, well. Spoilers ahead. Morte D’Arthur is a translation from the French by Thomas Malory while he pined away in a medieval jail. Though apparently a condensed version of the French books, it still weighs in at some 1100 pages or so. Utter madness when I have all these challenges to try to finish and I don’t believe it fills any of them. It’s a few years too late to be pre-printing press, although it was one of the first books printed in England. I could have read Sir Gawaine and the Green Knight. That would have qualified and is only maybe 250 pages. But no. I joined this challenge and made it at least to book V.
And I gotta say, this is a strange book. I’m having a similar reaction to it that I had to the Bible, which I had heard much about, but hadn’t actually read until college: this is not at all what I was lead to expect. Chivalry? Heroism? Not so much. Jousting there is. Combat in plenty. Lopping peoples’ heads off is the main thing and making people wear them like necklaces. Ew. There seems to be an awful lot of executions without trial and a great deal of idiocy. Oh, the idiocy. It’s rampant. That should have been their seal, most of them: an idiot rampant on a blood red field. Arthur, of course, is the major disappointment: sleeping around, including with his sister, killing all the boys born on a certain day in an attempt to escape his fate and generally fighting people for no darned reason. I understand, you’re a knight, you want to prove how great you are, but is it really necessary to kill everyone to do so? I say nay. One of the first lessons Arthur should learn: never promise a gift to be named later. Obviously hadn’t read his Greek mythology or he wouldn’t have done that. Also surprised that though he’s the only one who can pull the sword from the stone and this is a complete and total miracle, still hardly any knights accept him as king until after a giant battle or twelve. Arthur’s not the only one though. Balin, who’s so pure he’s the only one who can pull a sword from a certain lady’s scabbard, instantly belies his purity and like a jerk then refuses to give it back. She says you’ll be sorry, you’re going to kill the person you love best with it. Oh, that’s all right, he says, shrugging this off. Treacherous idiot. Balin makes every situation he encounters worse. He sees a knight about to kill himself. He stops him and makes him come visit his beloved who happens to be in the arms of another man at the time. 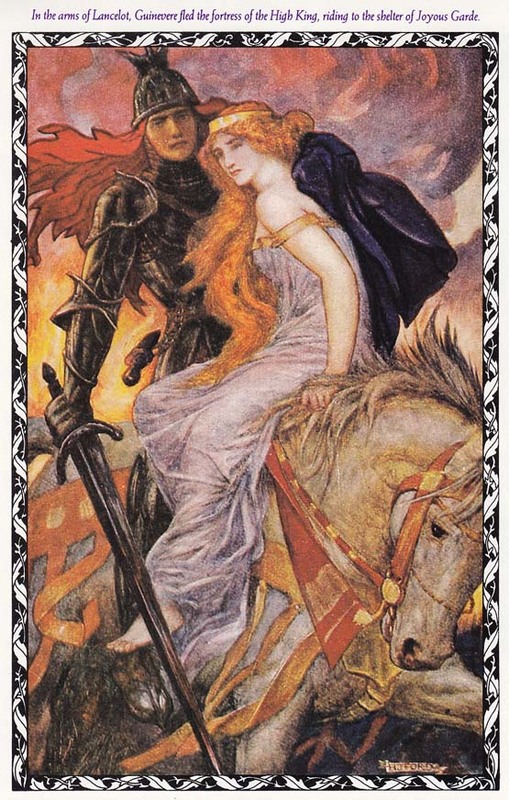 The knight then kills his love, her love and himself, instead of just himself. Thanks, Balin. Good work. Arthur is later given Excalibur by the Lady in the Lake. All very confusing. It being different from the sword in the stone though at one point that one is called Excalibur. So now he really has Excalibur and a scabbard that will stop him bleeding when hit. What does he do with these treasures? He gives them to his sister. Even if your sister doesn’t hate you with a passion, which she does, why the hell would you ever let this sword and scabbard out of your sight? You chop off heads every other day! Keep your damn sword! Also, apparently you could just walk into other peoples’ castles any time you felt like it, kill their hounds, or their girlfriend, and then get mad because they take offense. Might makes right and if it moves you should probably kill it. But sometimes you should just ride around alone with your friends and get captured by evil people. It’s a good thing to know whether your sister can turn herself into stone, but it’s also best, if you’re an evil queen, to go fetch the sword to murder your husband yourself. Finally we get to the part with Sir Gawaine and Sir Marhaus. Sir Marhaus is actually chivalrous and mighty. He kills when necessary, but doesn’t go around lopping off heads he shouldn’t. He takes care of his damosel and helps his fellow knights, unlike Gawaine who betrays Sir Pelleas and sleeps with his girlfriend. Sir Pelleas is also a decent knight. He’s in love with Ettard, but sadly, she doesn’t like him at all. When she sleeps with Sir Gawaine, Sir Pelleas wants to kill them both, but he restrains himself. Gawaine apparently has absolutely no reason for betraying Pelleas whom he promised to help nor any compunction for doing so. His damosel leaves him in disgust. This is rather funny, but also strange and I wonder if some significant part of the story got left out. I’ll carry onward with this weird book, but I wish I were a little ahead as I thought and not a week behind as it turns out I am. Which hour was most daunting for you? That would be either the 20th when I gave up and went to sleep or the 22nd when after waking up and reading a bit more I went to sleep again. Could you list a few high-interest books that you think could keep a Reader engaged for next year? I read The Bookman’s Tale which if you like academic mysteries, I think you’ll enjoy. Maybe a bit long for this event. Do you have any suggestions for how to improve the Read-a-thon next year? More readathons! What do you think worked really well in this year’s Read-a-thon? I think the whole thing is really well organized. Thanks to all the hosts and cheerleaders and everyone! How likely are you to participate in the Read-a-thon again? What role would you be likely to take next time? Very likely as a reader. So, sadly I didn’t even finish the one book The Bookman’s Tale. Sooooo close. Finished it this afternoon and enjoyed it. Our hero is dumb as a box of rocks at one point, but the story is pretty clever and an enjoyable read. A total fantasy, but I don’t really mind that. Who might like this? If you enjoy academic stories full of libraries, manuscripts, bookbinding, forgery and the investigation of it, stories which take place across centuries, then it should be on your list. The story follows Peter Byerly as a young widower, as a student and also follows a particular manuscript through the years. 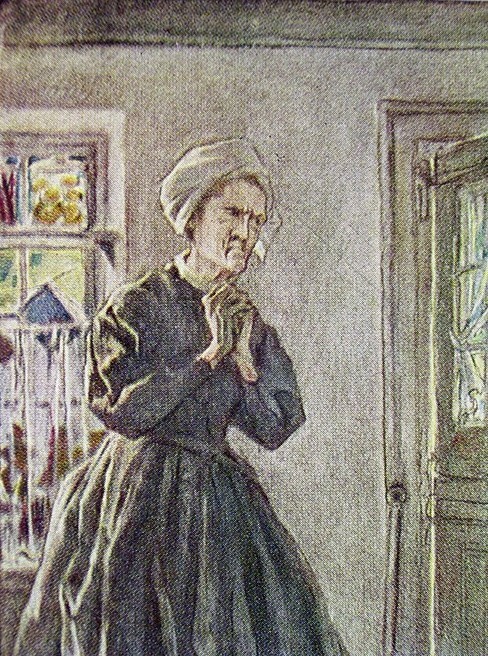 Byerly suffers from social anxiety and grief at the loss of his wife. We meet him in England trying to follow his doctor’s orders for getting his life back together. He’s a bookseller and he’s going into a bookstore for the first time since she died. He’s in Hay-on-Wye, a real town, really full of bookstores. He pulls a book about Shakespeare forger William Henry Ireland off the shelf and out of it comes a watercolor — a watercolor of his dead wife. Or that’s what it looks like, but it’s a hundred plus years too old to be his wife. (Now, what are the odds? Told you this was a fantasy.) This sets off a chain of events as he tries to find out who the woman in the painting was. As mysteries go, Lovett is no Agatha Christie and Byerly more of a Hastings than a Poirot, but the story is interesting, the idea is fun and despite moments of idiocy, Peter’s a likable enough guy to stick with. I definitely recommend this to anyone into academic mysteries or the whole Shakespeare authorship controversy. Thanks again to everyone who stopped by and everyone who ran this readathon! It’s always fun even if I can’t stay up 24 hours. Or finish a book. Noon – four hours done and starting a fifth. The big excitement is I’m moving to the couch. 8 PM – okay, where’d the last eight hours go? I was reading and then I had the opportunity to go on a short hike which had been rained out twice before, so thinking it was a good way to wake up and good for me generally, I did that, then I heated some frozen samosas and got back to my book. The cat made himself comfortable in my lap so moving wasn’t possible for a while. He seems to want a second dinner now. I have often explained to him it’s one dinner per day, but he doesn’t seem to absorb this. So, now we are halfway there and I’m about halfway through my book. Which has gotten quite interesting and if you’re at all interested in academic mysteries, I can highly recommend the first half. I’m sure though we’ve all read great first halves that fell apart in the second, so you should probably wait until I finish and let you know. I forgot. It’s time for the Mid-Event Survey! Still Bookman’s Tale. I told you I’m slow. The second half of this one! I had been hoping to read two, but I don’t think that’s likely. Took a hike. I interrupt myself a lot. I don’t really need help with that. That every one of them I seem to read slower than the time before. End of hour one. Read maybe 20 minutes. 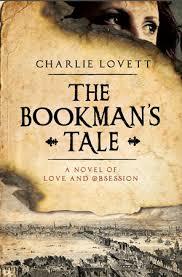 The Bookman’s Tale by Charlie Lovett. Will probably take me the whole day as focus doesn’t seem to be a thing today. Not the book’s fault as there’s a bookstore and a mysterious old painting of a dead wife. Funny there are at least three versions of the cover– the woman’s eyes look either off to the side, down, or straight out. Oh and mine has a different engraving of the Thames. Odd. Almost no progress, but I’ve got a kitty in my lap, coffee and maybe progress will happen next hour. Bleurgh. Tried to go to sleep early, but it didn’t work. But I’m up. And not terribly late. I just couldn’t get up early. Every minute of sleep seemed precious if I’m going to try to make it 24 hours. Maryland suburb of Washington D.C. Frozen samosas, if I can find them. This is my third readathon. I’m so not a morning person, reading doesn’t even seem possible. And yet I knowI’ve done it before. Still haven’t made it 24 hours. Also maybe I’ll try to be more scial. I don’t know. It’s eight in the morning! Well, almost 8:30. More coffee. With the Readathon tomorrow, I thought I should stop neglecting you, Dear Reader, and let you know where I am in all these projects. 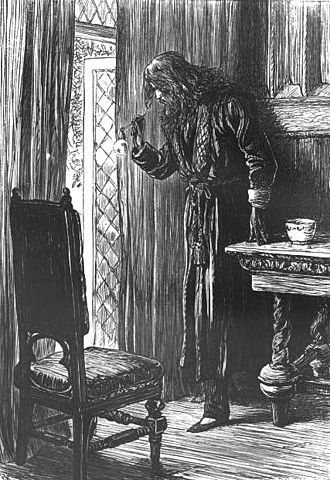 I’m sure you’ve been lying awake nights wondering if I got anywhere in Seven Gables or did my foolish joining in with the Morte d’Arthur readalong ruin any chances of that? I will try to catch up and fully inform you of all my readerly doings starting with The House of the Seven Gables. This was supposed to be read in September with Castle Macabre and co. Seemed like a great idea. Not too long a book. Fits in with R.I.P. Plus it’s old enough it’s a free download. Well, I downloaded it and I started it, but progress was slow. There is progress and I am now over half-way, but I find parts of it rather long-winded. Descriptions of Clifford sitting by the window go on for pages. I am not nearly so entranced by Clifford as Hepzibah and Hawthorne. The book has plenty of charming moments and a few creepy ones. Old Pyncheon’s death is quite good. And having just finished chapter 13 – the story of Alice Pyncheon, that was gripping enough to make me read on when I’d finished my MPR (minimum page requirement.) I’m hoping to finish it by the end of the month and I think that will happen even if the revealing of information continues at the previous glacial pace, though I think the pace has to pick up a bit. All the characters have, I think, been introduced. Now we need some villainous action and some seekrits revealed. One thing I noticed was the description of the house was not at all like the pictures of the one you can take tours of. Aside from the similarity of having seven gables, the real life house has no glittering plasterwork and other ornamentation mentioned in the text. The book house is several degrees fancier than the inspiration. I also am rather puzzled why the original Pyncheon wanted this particular bit of land so badly. It doesn’t seem to be especially good. But then people will fight over something just for the sake of the fight rather than the prize. Hopily I’ll finish soon and be able to give a view on what I think of the book over all. I think I enjoyed Marble Faun more, but then it’s been years and maybe I’m just forgetting that had dull bits, too.